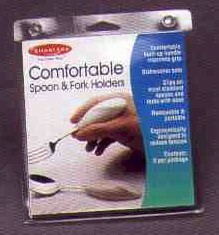 Spoon and Fork Holder; Elderly, Physically Impaired, Arthritis Sufferers. These comfortable spoon and fork holders slip on most standard utensils easily. Provides comfortable built-up handle to improve grip. Removable, portable and dishwasher safe. Ergonomically designed to reduce tension. Comes 2 per package.